On November 26, 1943 nearly two thousand American soldiers faced the most traumatic experience of their young lives. They woke up that morning aboard a vessel that some described as unfit for human habitation. Just a bunch of kids, mostly only a year or so out of high school. Exhibiting the expected Yankee cockiness, they were ready to take on anything the war had to offer. Having survived a Thanksgiving Day dinner the day before, things just had to get better. The sad part of it was, this would be the last Thanksgiving for over half of them! Their self-confidence was shattered when a German guided missile slammed into the port side of their ship, the HMT ROHNA, off the coast of North Africa. Deserted by the Indian crew and not having the benefit of life saving equipment, due to the deplorable condition of lifeboats and rafts, the fate of the men was left to the cold waters of the Mediterranean Sea and rescue operations hampered by darkness and heavy seas. When the night was over, less than half of those two thousand young men made it to safety. There would be no tomorrow for one thousand and fifteen young American soldiers! The survivors regrouped and served the rest of their tour of duty in the China-Burma-India Theater. They returned home to pick up the pieces of their lives and tried to suppress the memory of the event that changed their lives forever. While the Arizona and the Indianapolis were becoming household words, it seemed that the Rohna would be relegated to oblivion! For the next five decades very little was written about the Rohna tragedy. In the August 1994 issue of American History Magazine the editor, Ed Holm, wrote “After fifty years of scrutiny by historians around the world and the publication of thousands of books and magazine articles, it would seem that little new could be left to learn or reveal about World War II.” He further stated, “I recalled that more than eleven hundred crewmen had been killed when the battleship Arizona went down at Pearl Harbor in December 1941, and that nearly nine hundred other Navy men had died when the cruiser Indianapolis was sunk in July 1945. But I never heard of the Rohna”. Nobody ever wrote a book about what happened. Nobody made a movie or a television documentary. It just doesn’t seem right that so many people should have died in the sinking of the Rohna and that so few people now remember. It’s not that we forgot. It’s that we never knew. On his November 26, 1993 program the fiftieth anniversary of the Rohna tragedy, he said, “It was not until 1967 the story came out, and even now there is no monument. Fievet thinks there should be one”. With that comment, the seed was planted for a memorial to honor the men who died on the Rohna. James Blaine, who lost his brother Frank on the Rohna, noticed an article in the Los Angeles Times describing a memorial to the one hundred and twenty six men who died on the St. Lo. A subsequent letter to the Ft. Rosecrans Cemetery in San Diego provided us with the information as to how one could request a memorial in a national cemetery. Letters of inquiry were sent to the Department of Veteran’s Affairs and Arlington National Cemetery. Arlington replied with a “ho hum” letter offering space to plant a tree and an 18″ x 12″ marker. 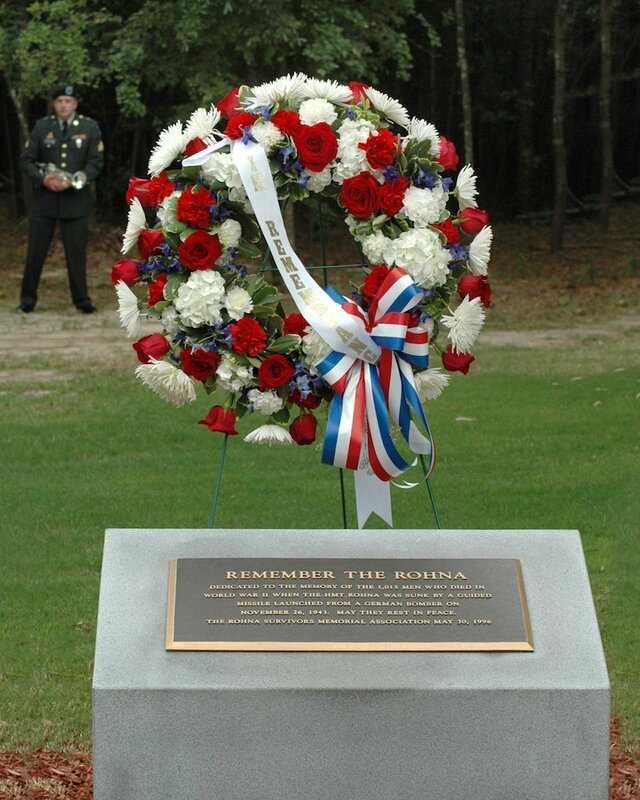 The Department of Veterans Affairs responded with an offer to permit the location of a Rohna Memorial in a national cemetery of our choice. They further stated that they were honored that we would consider a national cemetery to memorialize the brave men who died on the HMT Rohna. The sincerity and empathy expressed by the Department of Veteran’s Affairs led to the decision to place our memorial in a national cemetery. Even before we knew how it would be financed, an irrevocable decision was made to have a memorial dedicated to our comrades who died. At the 1995 Rohna reunion in Columbus, Ohio, it became evident that financing this project should be limited to survivors, next-of-kin and Pioneer crewmen. We would share this honor with no one else! Since the Department of Veterans Affairs rules stipulate that only a next-of-kin can request that a memorial be placed in a national cemetery, James Blaine graciously accepted this responsibility. 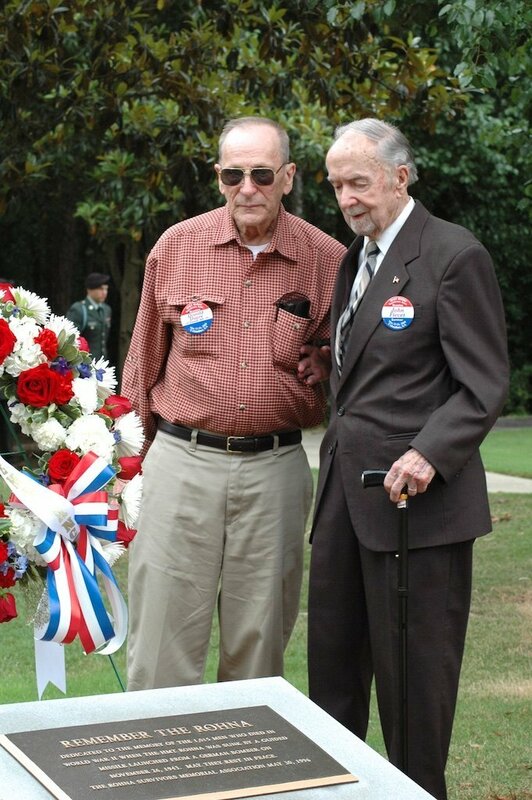 With the approval of Blaine and others, Fort Mitchell National Cemetery in Seale, Alabama was chosen for the memorial. Once we submitted proof that sufficient funds were available and that the monument we would supply would meet the Department of Veterans affairs specifications, it was suggested that the memorial be channeled through an established veteran’s organization. Since these organizations had shown little or no interest in this memorial, we voiced our objections to this course of action and subsequently were offered the option of forming our own organization, or requesting a waiver and dedicate it by an individual. We chose to form our own organization and thus the Rohna Survivors Memorial Association came into being. Conforming to the Department of Veterans Affairs rules, a constitution and by-laws were submitted and approved and the Rohna Survivors Memorial Association was recognized as the donor organization.